Set of innovative means Cherish Line for your perfect, enchanting beauty. Conditioner for eyelashes Cherish Lash effectively increases the growth of lashes and enhances their thickness, also has excellent strengthening and caring effect. Conditioner Cherish Brow enhances the growth of eyebrows, gives them a thickness and expressiveness, facilitates the process of modeling and provides eyebrows nutrition and strengthening. 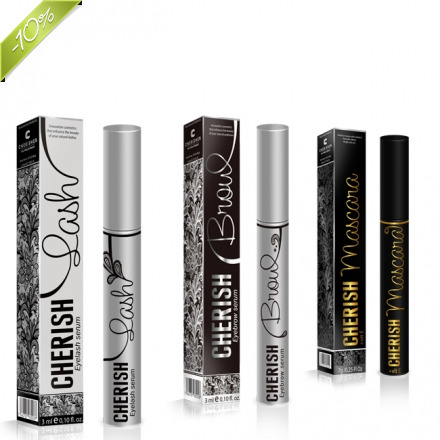 Cherish Mascara enormously increases the length of eyelashes, giving them the maximum volume and tightens up at the roots, provides deep nourishment and care. Deluxe Beauty Set consists of three means of breakthrough cosmetics line Cherish, which working together, fully reveal your natural beauty and make your perfect look. Cherish Line is an innovative line of professional cosmetics, which is based on a unique and valuable plant extracts and advanced cosmetic technology.